ChargeItSpot's Doug Baldasare proves that crazy ideas work when making sales pitches. LETTING THE PRODUCT DO THE TALKING. Doug Baldasare is using an unusual sales strategy when selling his phone-charging booths to companies and retailers. Doug Baldasare faced the dilemma of every new entrepreneur: How do you get in front of buyers when you do not have sales to show? 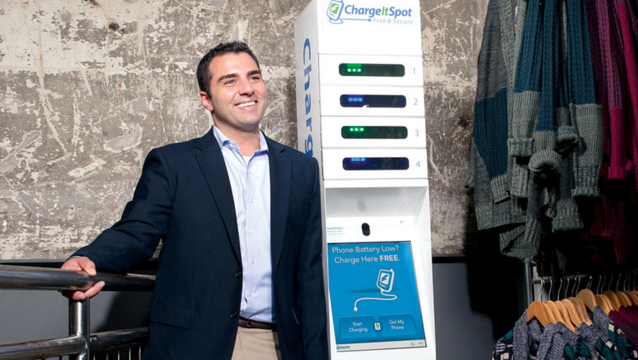 His company, Philadelphia-based ChargeItSpot, makes a phone-charging station for retailers, so customers can fuel up while shopping (and therefore stick around longer). Baldasare asked a professor from his days at Wharton for an introduction to a manager the guy knew at a local Whole Foods. Then Baldasare showed up with an action plan: After his presentation, he said, “Why don’t we just leave it here and try it out?” He rolled his charging unit into the café area, left it, and drove away before the staff had second thoughts. Six hours later, 50 people had charged their phones. An order followed. From there, Baldasare got bolder. For the CEO of one client, he used a 3D printer to create a one-tenth scale desktop version of the charger and left it on his desk. “The most important people in the company are going to see it,” he said, “and see it as a CEO-supported product.” He also gave the company its own charging unit, so employees would get to know it; the company was persuaded to increase their order. SHARING SALES STRATEGIES. Baldasare talks to students of The Wharton School, where he is an alumnus, during a breakout session. For another large client, Baldasare invested $35,465 in the company’s stock and sent a copy of the stock certificate to the CEO, with a note saying, “I know we will drive financial values and your shares will go up. This represents the total amount of dollars if your company went for our plan.” It worked – but if it hadn’t, Baldasare could have sold the stock back the following week. Baldasare thought of each new client as a challenge: What personalized, attention-grabbing stunt would win their business? Within a year, 11 retailers were featuring his chargers. Within three years, ChargeItSpot was in major retailers in 17 states across the US, and the company has raised $6 million in further investment – all because Baldasare embraced the joy of the sale.